C - CES 2004 - Does it get any better? The typical loudspeaker product is designed to make money and not necessarily to provide accurate sound reproduction. Since customers prefer small, unobtrusive speakers and judge sound quality by the amount of bass that they hear and by high frequencies they had not noticed before, there is a staggering number of essentially identical designs on the market that meet these requirements at different price points. No wonder then that there is a generic loudspeaker sound and that you can always tell whether something that you hear originates from a speaker and not from a live source. 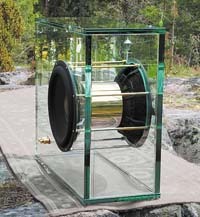 The marketing departments of the different speaker manufacturers are busy to point out differentiating features and breakthrough inventions when it comes to the highest price points, but in reality box loudspeaker design has come to a the end of a road and all you will hear are slight variations on the same theme. The fundamental problems of box re-radiation and non-uniform power response in a room are at best only partially solved by these conventional designs. Sound reproduction is about creating an auditory illusion. When the recorded sound is of real instruments or voices there is a familiar, live reference in our auditory memory. The illusion of hearing a realistic reproduction is destroyed by distortion that is added anywhere in the signal chain from microphone to loudspeaker, but the speaker is by far the biggest culprit. Every designer focuses on the on-axis frequency response as if it were the all determining distortion parameter. Sometimes great attention is paid to the phase response in an attempt to preserve waveform fidelity, which at best can only be achieved for a single listening point in space. Ignored usually, though of much greater importance, is resonance in drivers and cabinets and the slow release of stored energy that goes with it. Furthermore, the uniformity and flatness of the off-axis frequency response which we hear via room reverberation and reflections is rarely a design goal. You can check the naturalness of the timbre by listening from another room. Does it sound like a loudspeaker is playing? The imbalance in the speaker's power response between low and high frequencies destroys the illusion. And then there are the non-linear distortions, the ones that add sounds that were not present in the original. They are easily measurable in the form of harmonic and intermodulation distortion products. Rarely do non-linear distortion considerations enter into the design of speakers. 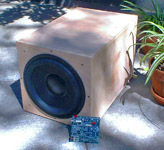 Otherwise, consumer stores and recording studios would not abound with 2-way designs - usually a 6.5" woofer/midrange and 1" dome tweeter in a ported box - that are physically incapable of the sound levels claimed for them and which by distortion often create a unique box loudspeaker bass experience, variously described with slam and speed. Some design attempts for reducing non-linear distortion lead to line source speakers. While successful at this they introduce phantom image distortions and, coupled with a conventional vented woofer of sorts, they suffer the same uneven power response and rich excitation of room resonances as the typical box speaker design. In my experience the only hope for creating a better illusion lies with open baffle, constant directivity speakers or with non-directive speakers like acoustic point sources. A few truly omni-directional speaker designs on the market come close, but require exceptional room acoustics since they interact maximally with the room. They also have to solve the problem of box sound re-radiation through enclosure walls and cones. The only other practical constant directivity design that can extend to the lowest frequencies is the dipole radiator. It has been commonly implemented as a large plane radiator surface with magnetic or electrostatic motor and sometimes as a long and narrow ribbon driver. While these approaches solve several problems there remain issues with limited dynamic range and critical placement due to their non-uniform in-room response as a result of their large sound emitting surface areas. These problems can be overcome by using conventional electro-dynamic drivers, which have much smaller radiating surface areas. Since they can have much larger excursion capability than their planar counterparts they will displace larger volumes of air and generate higher sound pressure levels, which is especially needed at low frequencies. It has become a useful learning experience for me to see and hear the latest loudspeakers, that aspire to the absolute best in sound performance. For this I drive to Las Vegas with my spouse for the International Consumer Electronics Show and T.H.E. SHOW. Usually these are large and expensive speakers. I pay little attention to 2-way systems since they cannot reproduce the full spectrum at adequate volume levels. 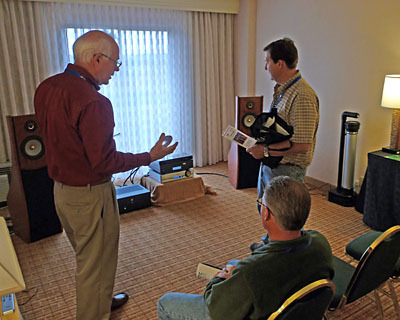 This year the outstanding leader in the conventional box speaker category was the $40,000 TAD Model-1. A superbly executed design under the leadership of Andrew Jones (KEF, Infinity, Pioneer), it exemplifies what can be achieved within the box paradigm. All the drivers and the cabinet design are very much from ground up and testify to years of learning and experience. I can only hope that customers for this type of speaker finally recognize that what had been offered to them as a statement product by the market leader in this price and status category is rather crude in comparison. On a different scale a 2-way box speaker from SLS with the company's own high-output ribbon and Seas drivers and combined with powered subwoofers had a very clean sound and excellent dynamic range. The speaker should fit well into a wide range of applications and audiences. I spent some time listening to the TacT Audio Room Correction system through their new speakers using Scanspeak drivers in M-T-M arrangement in a small tower and with powered woofers in left and right room corners, which were crossed over at a high 300 Hz. I had heard room correction systems in the past and they had left me unconvinced, probably because DSP was applied in a rather brute force fashion to the raw measured frequency response. The TacT system worked well in taming the bass response in this room and the experience did not seem overly sensitive to small shifts away from the sweet spot. Actually, the bass reminded me of what I hear from dipole woofers and the speakers with correction were close to what I am used to hear from the open baffle ORION. A different class of loudspeaker that has held my fascination is the uniform line source. Potentially it can have very low non-linear distortion since the radiating surface is large and excursions can be small. Furthermore it launches a tall wave-front which tends to dominate over any room contribution. I listened to speakers from Nearfield Acoustics, Wisdom and Impact. All are remarkable loudspeakers even though the technology of their drivers is very different. Pipedreams uses large arrays of soft dome tweeters and small cone drivers. Wisdom uses long ribbons, actually three next to each other in the speaker I heard. 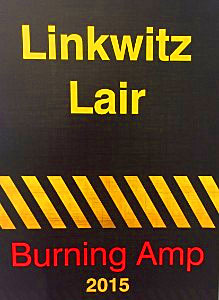 Impact employs an "Airfoil driver" array that is an evolution of the excellent Linaeum tweeter. If there were differences due to the driver technology then I would rank the conventional drivers the lowest, the ribbons higher and the airfoils at the top, though neither would make me run to replace what I am using, even if I could. The woofers were in all three cases variations of the typical vented box and had the typical room problems. 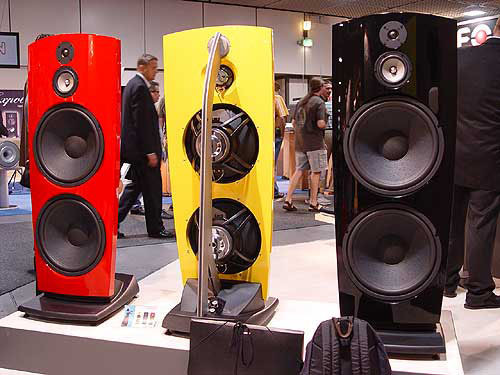 What interested me most was the sound presentation of these nearly floor to ceiling speakers. Their sound is big and close up. Like watching Patricia Barber's lips move on a large movie screen. It's very impressive in its detail, if that is what you like. As an illusion of the real thing it did not pull me in. 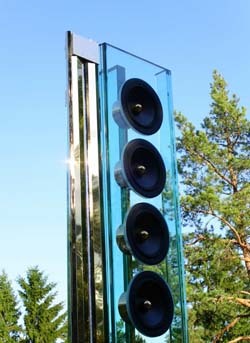 It seems to me these types of speakers will be at their best in very large venues when listened to from some distance. Conversely, I liked the Pipedreams best when I sat really close and heard only to a section of the tall line, as if they were giant headphones, but then a much smaller speaker could do the same. My conclusion is that uniform line source speakers are not what I would pursue for accurate sound reproduction in typical size domestic rooms. 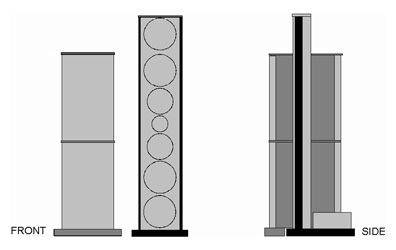 Tall speakers would be best configured with drivers in symmetrical W-M-T-M-W layout, which approximates a source of more constant acoustic size. I did not hear anything that made me wonder about the appropriateness of the open baffle speaker for small acoustic spaces. The very large SoundLAB electrostatics, though, gave the same oversize image impression of the uniform line sources above. The new $50,000 Element e50 dipole speaker, which uses multiple small planar ribbons and cone drivers together with a servo driven box subwoofer, had the initial appeal of an open spacious sound, but suffered from acoustic rough edges upon longer and critical listening. Build your last loudspeaker yourself !! I am more than ever convinced that this can give you a speaker that will fully satisfy and engage you and additionally has a performance-to-cost ratio that far exceeds anything on the market. I am working on making it more accessible to a wider audience. C - CES 2004. Does it get any better? A full-range speaker needs to be at least 3-way. The typical 2-way speaker can be easily equalized for flat response down to 20 Hz, but it cannot produce sufficient low distortion acoustic output in the frequency range where the ear has low sensitivity. A 4-way speaker should have no such problem, but the design complexity increases dramatically for optimum performance in other parts of its frequency range. The ORION is 3-way. Then there is the cabinet. Should it be a closed box, vented box, open baffle, or a combination of those? If the low frequencies are reproduced from some form of a box, then the polar response will be uniform or omni-directional up to several hundred Hz. This uniformity in polar response needs to be carried up in frequency and leads to speakers such as those from MBL or the new Beolab 5. In contrast, the vast majority of loudspeakers today are boxes and exhibit increasing forward directivity with increasing frequency. Their power response rolls off at least 10 dB with frequency. Box speakers suffer from strong excitation of listening room resonances in the frequency range below 200 Hz and uneven bass response unless absorptive room treatment is applied. The Beolab 5 uses a clever woofer equalization scheme which seems to work well. It had, for example, no problem reproducing the very low frequency drum note at the beginning of the 'Temple Caves' track from the Planet Drum CD, when several over $40,000 speaker setups had failed the test. The open baffle, or dipole, loudspeaker is the least room resonance sensitive platform, though in planar form it suffers from insufficient output at low frequencies. At higher frequencies the planar radiator becomes acoustically too large in size with consequently irregular polar pattern. The ORION, instead, employs acoustically small cone drivers with large excursion capability in an open baffle arrangement and is capable of high volume bass output down to very low frequencies and wide dispersion at high frequencies. The drivers ultimately limit the accuracy of reproduced sound, ignoring for a moment the recording side of the signal chain. Some of the cone drivers - for lower frequencies - and some of the dome drivers - for higher frequencies - are now the lowest distortion, most reliable and rugged forms of electro-acoustic transducers available. Ribbons are fragile and acoustically too large for a uniform polar response. Horns have linear distortion in the form of resonances, or stored energy, and narrow polar response. The frequency response of any driver can be equalized, but non-linear distortion and stored energy cannot be removed. When I wander around CES I pay great attention to the sound quality of the drivers used by different manufacturers. The cone and dome drivers used in the ORION are as accurate as I have been able to find by listening and by test. The right drivers can only make for a great speaker when used with a cabinet of proper acoustic and vibration behavior, and with electronics that tailor the frequency response of each driver to obtain minimum distortion and desired overall polar response. In addition, the drivers need adequate power and this is most effectively accomplished by assigning an individual power amplifier to each unit, rather than to use a single, very large wattage amplifier for all of them. This avoids power losses in passive crossover components and gives maximum control over the motion of each driver. It also makes it easier to find amplifiers where the most important 'first watt delivered' is very clean. The ORION uses four power amplifiers per speaker. They are driven from a 3-way fully active electronic crossover/equalizer. All electronic elements are matched to each other for optimum performance. The driver and baffle dimensions, and their shape, strongly affect the frequency response on-axis and off-axis. From all my experience, I would argue for a near constant directivity that extends from the lowest frequencies up to around 5 kHz. An ideal dipole has 4.8 dB directivity, its frequency response is 3 dB down at +/-45 degrees off-axis, and -6dB at +/-60 degrees. This is a good target. An omni-directional speaker would have low frequency and possibly high frequency room interaction that requires treatment. A speaker like the Beolab 5 was designed for wide dispersion in a horizontal plane using a particular layout of drivers and baffles, though this limits the vertical dispersion. On listening, the soundstage seemed to have a slight balcony perspective, which is common with many speakers. The ORION presents a soundstage that is also tall. A form of linear distortion that is not corrected in the vast majority of loudspeakers is due to acoustic phase shift, if it increases non-linearly with frequency. I have heard speakers from Thiel and Dunlavy, which claim linear phase shift, but cannot say that this feature was noticeable. I have not heard speakers with DSP linearized phase shift, but would not expect anything significant in this regard. My own experiments, and corroborative investigations of others, have convinced me that the 24 dB/octave acoustic crossovers used in the ORION at 120 Hz and 1400 Hz have no noticeable detrimental effect, though they change the shape of the signal waveform. In summary, I come back from CES 2004 with confirmation that the ORION is on a right track, even when it only employs readily accessible technologies. Its platform is solid. Any improvement would come from the drivers used, though I could not say with certainty in what form. Ultimately the sound is limited by what has been recorded. The IsoMike recording experiments by Kimber Kable successfully aim towards greater realism. For my own use I will continue the investigation of the proper addition of recording venue ambiance, or background sounds, to the playback. It needs to be subtle in order to enhance the illusion of realism. Multi-channel surround sound seems to follow the 5.1 Home Theater route, but when you buy a DVD-A or SACD recording you find great variability on how the 6 recorded tracks were assigned to specific microphones. SoundField microphone recordings played back over 4 full-range speakers could be highly satisfactory and remove the variability introduced by center speaker and subwoofer. 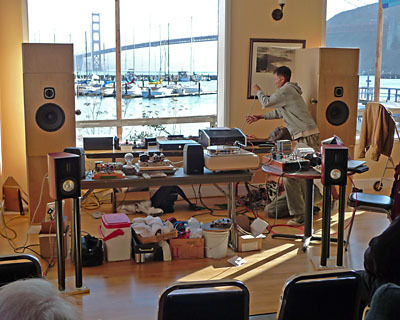 Such system can deliver new artistic expression as demonstrated by Kevin Halverson of Muse Electronics with a Chesky recording. The future will show whether multi-channel music playback will take a deserved place in the home, not just in the Home Theater or the automobile. Adding to the comments above, I want to describe the basic design and acoustic radiation characteristics of some of the loudspeakers that I have built and explain their possible interaction with the room. At the listening position we hear the direct sound from the speaker, and since the speaker illuminates the room to varying amounts at off-axis angles, we also hear the delayed room contribution in the form of reflections, reverberation and room resonance or modes, and those contributions are colored by the off-axis frequency response of the speaker and the absorptive and diffusive properties of the room's surfaces and the objects in it. It is a complicated situation and only broad trends can be predicted. Here is a 2-way satellite and subwoofer system that was published 1978 in Wireless World. I was aiming for a small box size to obtain wide dispersion. The woofer is flush-mounted to radiate into half-space. The satellites hang from strings and away from reflecting surfaces. The satellites transition from full-space, omni-directional radiation to increasingly forward radiation above 500 Hz, though with a broadening again as the tweeter takes over. 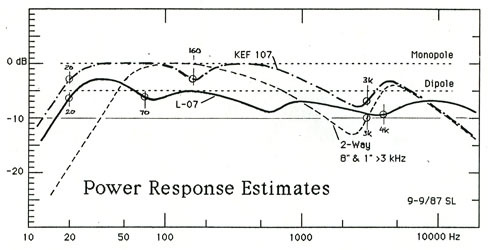 Equalized for flat on-axis response, this system is an early attempt at reducing the off-axis frequency response variation which is typically summarized by the 'power response' of a loudspeaker. The 2-way satellites have a power response with less variation than the example in the graph below, because of the smaller woofer diameter and a lower 1.5 kHz crossover frequency. 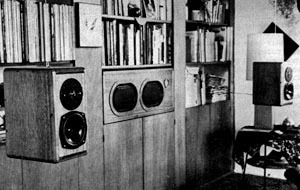 The satellites could be placed into the book shelf behind them so that they were essentially flush-mounted like the woofer. This eliminated edge diffraction and the reflections from the wall behind the speakers when they were hanging. Though the resulting power response and in-room frequency response was smoother, the listening experience was disappointing and gave the impression of the sound literally coming off the wall rather than being in the room. I concluded then that the front baffle of speakers should be at least 3 feet from adjacent surfaces for best imaging and depth perception. With the speakers hanging freely the soundstage was wide and deep though not particularly tall. Bass response was very smooth with the woofer away from room corners and intersecting wall surfaces. 1) A small 2-way closed-box speaker with 8" and 1" drivers crossed over at 3 kHz. 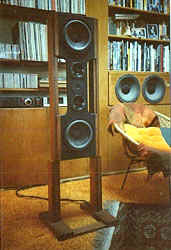 2) The KEF 107 as a 3-way speaker that was typical for good speakers of the time. 3) The L-07 was 3-way dipole speaker with front and rear firing tweeter and a wall mounted closed-box subwoofer. An early dipole development was the L-07. Its power response starts at a 4.8 dB lower level than a monopole. Its W-M-T/T-M-W arrangement of drivers narrows the vertical dispersion somewhat and reduces total power output further. The increasing beaming of the front tweeter with higher frequencies and shorter wavelengths is compensated power-wise by a rear tweeter. The surface mounted subwoofer has 3 dB lower total power output than in free-space for the same on-axis SPL. The above power response estimate for the L-07 is an improvement over the 2-way satellite/subwoofer system. This was clearly audible as a smoother and more open sound. 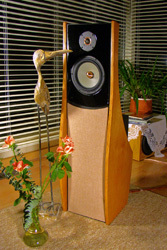 The Quad ESL-63 electrostatic loudspeaker has been a strong inspiration to me. I loved the neutrality and realism of its sound the first time I heard it. 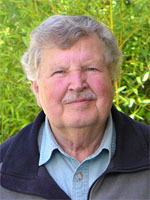 Peter Walker designed it to act as a dipole point source by breaking up the large radiating surface into circular rings which were then driven from a tapped delay line. Besides having exceptionally low non-linear distortion, this is a speakers which has a minimum phase response. This should be of particular interest to audiophiles who consider 'transient perfect response' - as much as that is physically possible in a band-pass system - to be of importance for their music enjoyment. The ESL-63 has two prime weaknesses: Its tweeter disc is acoustically large which leads to beaming and a tight sweet spot. It has limited low frequency output volume and overall dynamic range. I like to listen at near realistic sound levels and so my goal was to design a speaker that preserves the admirable characteristics of this one and some other planar speakers, but without their shortcomings. This goal set me on a journey from which the L-07 is an early example. This design became simplified, and was described as a 'compact dipole speaker' in one of my AES papers, using M-T-M main-panels and separate dipole woofers. From this I developed a line of Audio Artistry loudspeakers, the Dvorak, Vivaldi and Beethoven. The PHOENIX project belongs to that family. With the availability of improved drivers it became possible to build an even more compact open baffle speaker, to improve the uniformity of the polar response, to extend low frequency response and volume while maintaining a very large dynamic range. This is the ORION. The total SPL capability of the ORION can be further increased by adding two closed box, monopole THOR subwoofers. This might be needed for home theater applications or where extremely high volume levels of music can be tolerated in a domestic environment. This turns ORION into a 4-way system with added crossover at 40 Hz. Now the tweeter becomes the system component that ultimately limits the maximum SPL. Similarly, it is the tweeter that ultimately limits the maximum sound output capability of the Audio Artistry Beethoven-Grand. This open baffle speaker, though, was designed for much larger rooms. 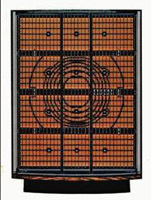 The symmetrical driver arrangement on the physically very tall main panel maintains a more constant acoustical size of the source and gives increased vertical directivity. Thus the speaker reaches deeper into the room for greater listening distances. The large number of drivers keeps non-linear distortion very low. The dipole woofers employ eight 12" drivers each. 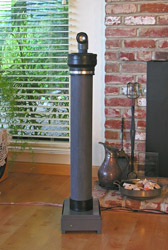 A loudspeaker of completely different size, cost and shape is PLUTO. It approximates an acoustic point source, an almost perfect monopole. Being omni-directional it has a power response that is essentially flat from 60 Hz to about 3 kHz where it begins to roll off as the speaker becomes increasingly forward aiming due to the increasing acoustic size of the tweeter with increasing frequency. PLUTO illuminates the room very uniformly and thus the response from an acoustically neutral room adds no coloration to the direct sound. Tonality and openness are almost indistinguishable from the ORION when set up corresponding to their reverberation distance. Imaging is superb. The small drivers limit, of course, the maximum low frequency SPL. THOR subwoofers could be added, but that would defeat the speaker's small size and easy portability for optimum placement in small rooms. PLUTO's performance has shown me again the importance of the polar response. It confirmed that there are two optimal choices for loudspeakers in domestic size rooms, either a wide-band, uniformly directional source, like an acoustically small dipole, or an omni-directional source. The uniformly directional dipole source has the advantage of 4.8 dB more direct sound than reverberant sound. It also gives a subjectively more accurate low frequency reproduction, though I have not found a totally convincing physical explanation for this. The omni-directional source gives stronger excitation of the reverberant sound field and of room resonance modes below 150 Hz, but their effects can be minimized by listening from a closer distance than is typical. For this to be practical the omni source has to be acoustically small so that the sound field generated by woofer and tweeter is already well integrated at close distance. The vast majority of commercial loudspeakers, though, lacks directionality at low frequencies to go with their inherently increasing directionality from a few hundred Hertz on up. They engage the room differently over different parts of the frequency spectrum. This contributes strongly to a generic loudspeaker sound that everyone is familiar with to the point of expecting it, but which is not experienced when listening to the ORION and other wideband directional speakers, or omni speakers like PLUTO. In the latter case the listener must sit closer and the speakers be placed out in the room. I can now say that I have explored the different loudspeaker design options to my satisfaction. With PLUTO I will put the dot on the i. It's time to relax and enjoy the music! 4 - Auditory Scene Analysis by Albert S. Bregman, 1990. I have the feeling that this subject is worth studying for its possible application to loudspeakers and to sound reproduction in rooms. Jamo of Denmark, a subsidiary of Klipsch Audio Inc., introduced in September 2005 their Reference R 909 "statement audiophile product" at the Internationale Funkausstellung, IFA Berlin. Price is reported to be around $12,000. Transition from two 15" woofers to a 5.5" Seas midrange (M15CH002 ?) is at 250 Hz. Crossover to a Scanspeak Revelator tweeter is at 2 kHz. The polar response of these speakers should be interesting above a few hundred Hertz. But finally someone big seems to be catching on. Perfect 8 may not be a company you have heard about, but when I look carefully at the pictures in their portfolio, I could easily become convinced that "The Force" is a superb loudspeaker. Over the years I have had stimulating email exchanges with its designer, Kolja Willimzik. After a one year break I drove to Las Vegas to attend the Consumer Electronics Show and T.H.E. Show with the primary purpose of meeting a number of people to discuss futures and secondly to see and hear what's new. As in the past I was impressed with the many ways one can make sound, yet the apparent difficulty of creating a you-are-there experience, rather than one of loudspeakers in a room. From giant horns with compression drivers using massive field coil motor structures (Cogent True-To-Life Loudspeakers), to tall line sources with large numbers of identical drivers (e.g. DALI MegaLine, and redesigned PipeDreams by High Emotion Audio), to the almost infinite number of small variations on the theme of the conventional box loudspeaker (new TAD Model-2, Burmester B100, Magico Mini, Sonics Allegra, etc., etc.) there was something for everyone. 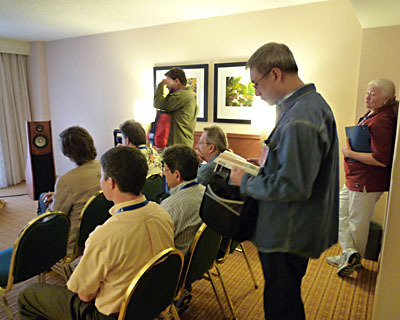 It was fun to observe some reviewers attentively listening to their own test tracks, or to what the speaker manufacturer put on, presumably to hear something of significance to write about in the magazines. I did not hear anything that made me want to try my hands on, or that makes me rethink the ORION concept. It emphasized again to me that ORION belongs to a different paradigm, and that most speaker designers seem to be either unaware of the ensuing benefits, or deem them not to be viable to their target audience. I did see the Jamo R 909 open-baffle speaker and liked its appearance, but could not listen to it on the Convention Center floor. Using passive crossovers to cater to the prejudices of the high-end audio market place, Henrik Green Mortensen had to make design trade-offs in order to approximate the necessary dipole equalization of the woofers. But even so, the advantages over a box speaker design should be clearly audible. My skepticism about the subjective effectiveness of different room correction methods was greatly reduced after hearing the Lyngdorf Audio (formerly TACT) TDA 2200 Digital Amplifier with its room correction module driving a pair of MH-1 Mk II speakers and two W210 Corner Woofers in a small hotel room. The correction algorithm, designed by Jan Abildgaard Pedersen, uses the information from several sound field sample points at random locations in the room and from a sample at the listening position, rather than taking samples only near the listening position or measuring only the acoustic load impedance that the room presents to the woofer cone. Small room acoustics are a multi-dimensional problem (time, frequency, space, psycho-acoustics) where both global and local characteristics affect the perceived sound. I was very impressed by the articulation that the correction produced in the bass region completely removing the boominess that was there otherwise and without artificial spatial effects. 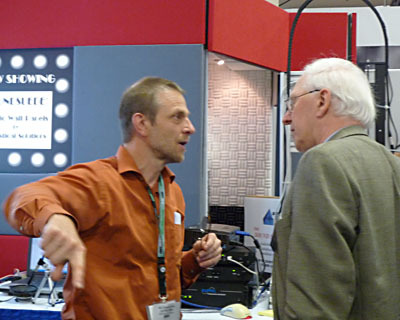 Peter Lyngdorf expressed to me his opinion that accurate bass reproduction requires either dipoles or conventional woofers with room correction. Of particular interest to me was the discovery of a 1 inch full range driver with 2.8 mm linear Xmax excursion capability. Made by Wave9 Systems Limited and guided by their CEO Rick Weisman, their AX-20N driver looked like a clever, low cost design, ideal for application in thin, floor to ceiling line sources. While I have no plans for any such speaker this driver might solve a low frequency signal-to-noise problem that I currently have with a 10:1 scale model of a 20' x 15' x 8.3' rectangular room in which I want to study the location dependent frequency and time responses in the modal and sub-modal region, between 50 Hz and 2000 Hz, for dipole and monopole sources. This also requires scaling the reverberation time by 10:1 in order to model a real room and not a reverberation chamber. It is already clear that the behavior below the lowest room mode of 280 Hz is highly structure dependent and can have multiple resonances and anti-resonances. The frequency response is independent of source and microphone locations. A meeting with the Tymphany team, with Michael L. Hackworth and Ken Kantor, assured me of their commitment to the Peerless XLS drivers that I use for ORION and THOR and that delivery problems due to relocation of their production line within Denmark have been resolved. Their LAT Linear Array Transducer is a very compact woofer driver design with a form factor that is well suited to small spaces like cars. It might also be applicable to a dipole woofer in an H-frame where it would provide complete mechanical vibration cancellation. Extensive discussions with Wolfgang Klippel who exhibited together with the SEAS team gave me an appreciation for the use of his SIM 2 module in designing a new loudspeaker and making driver selections. Basically, the new speaker is first completely designed in the small signal, linear domain such as is common praxis today. Next, the large signal, non-linear parameters for a given set of drivers are imported. They should be available from driver manufacturers who have the Klippel Analyzer or independent test houses. Now the large signal behavior of the complete loudspeaker can be simulated. Harmonic distortion, intermodulation distortion, thermal effects, etc, can be investigated for different sound pressure levels. Crossover frequencies may have to be shifted as a consequence, slopes increased, or different drivers used to reduce distortion. As always, I enjoyed discussions of future directions in driver design with SEAS R&D Manager Olav Mellum Arntzen. Any further reduction in non-linear distortion of the ORION would have to come from its drivers. All in all, a worthwhile trip even if I picked up some crud from one of the 150,000 attendees or the air conditioning systems that cut my following ski vacation at Mammoth Mountain, CA, short by a day. Too bad, the snow conditions were just perfect. A brief discussion of the underlying design concepts for these two very different loudspeaker systems should explain why in the end they sound closely similar in my relatively large living room. ORION is basically an open baffle, dipole like source from the lowest frequencies up to about 1.5 kHz, while PLUTO is essentially an acoustic point source and omni-directional up to about 3 kHz. The differences in radiation pattern make PLUTO illuminate the room like a bare light bulb and ORION like two back-to-back flashlights, roughly speaking. So at the listening position there will be more delayed replicas of the direct sound for PLUTO than for ORION. Contrary to common belief such replicas are not a detraction, but actually enhance intelligibility and imaging, provided that they are broadband. Problems mostly appear at low frequencies, in the modal range of the room, where discrete strong resonance can muddy the sound. Here dipole radiation can have advantages. Now PLUTO has sealed baffles, but unlike the majority of box speakers it has no significant sound coming off flexing panels or through the driver membrane from the inside of a box. Structure borne panel vibrations and the difficulty to attenuate air borne sound inside an enclosure are two major problem areas for conventional box speakers that are extremely difficult to avoid. Just look at the effort it takes to build extremely stiff and inert enclosures, and yet the paper thin driver membrane cannot block what is happening on the inside from coming out. These two problems drove me to open baffle speaker design before I even considered benefits from their directional behavior. PLUTO, though, minimizes the box problems by using pipes. They are extremely stiff, so there is no panel radiation. The length of the pipe enclosure makes it possible to build a fairly decent acoustic absorber. Thus, little of the sound which travels inside the pipe comes back out through the cone again after it has been reflected at the closed end of the pipe. The other problem with boxes is their shape and the panel area to which drivers are mounted. These cause the speaker to be omni-directional at low frequencies or long wavelengths, and to become forward directional at high frequencies. Thus their off-axis response rolls down from low to high frequencies by over 10 dB, the room is illuminated unevenly, and the replicas of the direct sound lack high frequencies causing a dull rather than open sound. PLUTO fires upwards, downwards, and uniformly around over most of its frequency range. In terms of the absence of secondary radiation through the cone, the enclosure walls, and edge diffraction, PLUTO behaves like a box-less speaker. Finally, most box speakers use vented enclosures which means stored energy to increase otherwise insufficient or distorted bass output. PLUTO+ is sealed with a Q = 0.5 roll-off at the low end of its frequency range for optimum highpass transient response. ORION and PLUTO+ share uniformity of polar response, though they are fundamentally different, a dipole versus a monopole. Both kinds of speakers have been around for a long time, though their typical implementations have created their own sets of problems. Large panel radiators exhibit generally poor polar response and often limited dynamic range. Omnis must use physically small drivers, which require 3-way or 4-way arrangements for sufficient acoustic output. Some commercially available omni-directional loudspeakers now seem unnecessarily complex when a simple PLUTO+ can deliver such high level of performance. I read some recent comments at 6moons.com about my PLUTO+ and ORION design approaches. I want to add further background. When designing loudspeakers it is important to understand which perceptual cues contribute and which detract from generating an illusion in our mind that we are hearing a real voice, or instrument, or orchestra. Distortion gives the wrong cues and is primarily due to on-axis frequency response errors, non-uniform off-axis or polar response, stored energy in various acoustic and mechanical resonances, and the generation of additional sound components due to non-linear mechanical and electrical parameters in drivers. PLUTO+ and ORION are two speaker examples for which I considered all of these distortion mechanisms and tried to minimize their effect. As a result both systems sound closely the same, and both can give a satisfyingly accurate reproduction of a well recorded acoustic event. PLUTO+ remains more sensitive to the room, but is smaller, lighter and therefore more easily placed into optimum location when the occasion demands. I hope that both find their way into many music lover's homes. They each are as inexpensive, given their different approaches to speaker design, as I know how to make them for the high level of performance that I tried to reach and obtained. 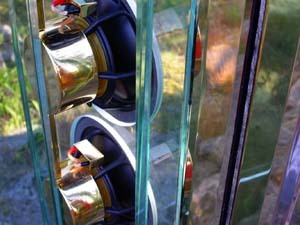 Sound wise they share the desirable attributes of typical dipole or monopole loudspeakers, but avoid their weaknesses. Thus, starting from the two classes of loudspeakers, open-baffle and closed baffle, and when stripped down to their bare essentials, I ended up with ORION and PLUTO+. One implementation still has some furniture aspects to it, the other is pure machinery in appearance. Both have their own beauty. Having just returned from the AES Convention I want to point out a few developments that hopefully will have an influence on the design of loudspeaker drivers, on the way loudspeakers should illuminate the room, and on shaping the sound field in the room for realistic spatial reproduction. Floyd Toole gave his ever refined 3 hour PowerPoint presentation on "Loudspeakers and Rooms". Most of the material is contained in his JAES, June 2006, paper, but it is always different to hear and see the author directly. In particular I would hope that the material debunks some of the widespread misunderstanding and thus misapplication of the Haas effect and leads to an appreciation of the potential contribution of early reflections in small rooms to the overall diffusiveness of the sound field and phantom image stability. There are too many mechanistic acoustic models in the popular Hi-Fi press and consequently naive approaches to fixing room acoustic problems that ignore the adaptability of the processor between the ears. For frequencies below 150 Hz the room can dominate, but at higher frequencies the loudspeaker's polar response is the essential contributor to the quality of the reproduced sound and not room treatment or equalization. I suggest to keep the sound from the loudspeakers alive. Merely make sure that the sound from your hand clap dissipates smoothly in the room. If absolutely necessary, notch out electronically one or two room resonances in the deep bass. Wolfgang Klippel gave a paper on "Measurement and Visualization of Loudspeaker Cone Vibration" (Preprint 6882). He also demonstrated a new optical scanning setup, using a Laser triangulation technique to measure displacements down to 0.5 mm with >40 dB (!) signal-to-noise ratio at up to 20 kHz. It is a cost effective alternative to Doppler interferometry. For 3D and 2D animation he uses a novel decomposition of the cone displacement data relative to their contribution to the sound pressure at a distant point in space, on-axis or off-axis. This decomposition of the total cone movement shows the time varying cone displacement that adds to the sound pressure at that particular point (in-phase), that subtracts from the pressure (anti-phase), and the cone movement that has no contribution (out-of-phase) at that point in space. The out-of-phase displacements can be very large at certain frequencies and while they do not contribute sound, they may generate non-linear distortion products or off-axis response irregularities. Hopefully this tool leads to a better understanding of the radiation properties of specific drivers, improved designs and products, similar to the effects of Klippel's large signal analysis, simulation, and production control tools. The subject of Ambisonic sound reproduction came up in several papers and tutorials. Eric Benjamin et al reported on work in progress with their "Localization in Horizontal-Only Ambisonic Systems" paper (Preprint 6967). The beauty of Ambisonics and its coincident Sound Field Microphone is the possibility to reconstruct the recorded sound field with a small set of loudspeakers accurately for one 'sweet spot' which does not degrade rapidly as you move away from it. The microphone records only 4 signals: the sound pressure or energy at the center of the microphone array, W, and the velocity and energy vector directions in X, Y, and Z planes. This information can be decoded for different speaker numbers and layouts to reconstruct the original sound field. In 1974 Michael Gerzon was ahead of his time. With today's DSP capability all the required signal processing is relatively easy to perform. The approach is fundamentally different from 5.1 surround which is a pair-wise panned mono setup with strong image pull to the nearest loudspeaker. I would be very interested in seeing Ambisonic come to live again as I remember fondly an early demonstration at KEF. Related to Ambisonics and sound field directional recording is the work done by Trinnov Audio in France. In particular I was intrigued by their tetrahedral array of small omni-directional capsules (Panasonic?). They use it to measure loudspeakers in rooms. For a given loudspeaker and microphone position they can decompose the four microphone outputs with DSP into the direct sound from the speaker, into the reflections in the room (including their direction) and into low frequency modes. This information has been used to equalize monitor loudspeakers or to apply room treatments when the same type of loudspeaker is used in different venues, like a recording studio versus a large recording van as used by TV broadcasters, where the sonic signature of the monitor must be maintained. It can also be used to sonically match different types of loudspeakers to each other. The Convention was a great opportunity to meet up with long time friends and to make new ones, where all share a love for music and a desire to learn about its accurate reproduction. This was certainly a busy month for me. 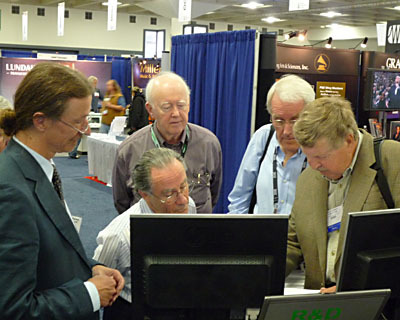 It started with driving to the 125th AES Convention in San Francisco on four days in a row. Not too far though, but lots of traffic and considerable parking costs. It is always stimulating to meet long time friends again and discuss audio matters. These days my interest is in the perceptual aspect of audio, how we construct phantom images of an auditory scene in our brain and what that implies for loudspeaker design and recording techniques. Thus I skipped several important papers to attend Robert Schulein's Master Class on "Binaural Audio Technology - History, Current Practice, and Emerging Trends". Everyone had headphones to follow the demonstrations using a KEMAR mannequin and several audio with video presentations. It was an excellent and comprehensive illustration of what binaural transmission is capable of. In the end though I was bothered by the spatial distortion of the phantom images. In particular, I was not able to localize frontal images clearly outside my head. Later that day Prof. Richard Duda gave me a demonstration of a head movement tracking system which clearly allowed me to visualize a monaural recording of a jazz band outside of my head and staying in fixed absolute location while I turned a full 360 degrees. When the tracker was turned off the image stayed outside(!) the head until I started turning my head left, right. Then it moved smoothly towards me and lodged between the ears. This was an impressive example of how the brain processes head rotation cues for localizing a source. "Where is the acoustic center for a driver in a baffle? John Vanderkooy and Stan Lipshitz are great teachers. 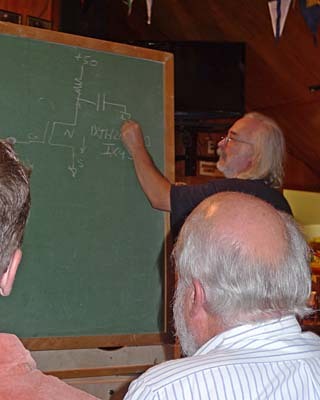 John gave a Master Class on "Basic Acoustics - Understanding the Loudspeaker". My connection to Laurie Fincham dates back to 1974 and KEF. Our air mail letters crossed the Atlantic back and forth. I am placing our first written exchange on this website as a reminder of where loudspeaker design was at that time. It is technically a lot easier today, but there is still no full agreement upon the perceptual importance of some parameters. Wolfgang Klippel gave the paper "Distributed Mechanical Parameters Describing Vibration and Sound Radiation of Loudspeaker Drive Units". It characterizes effectively the cone break-up modes and their contribution to radiation. I had interesting discussions with a number of audio engineers about how the brain seems to deal with phantom sources and under what conditions they are located outside the head. They were further motivation to present papers at the next AES Convention in Munich, jointly with Don Barringer, who is experimenting with recording techniques. 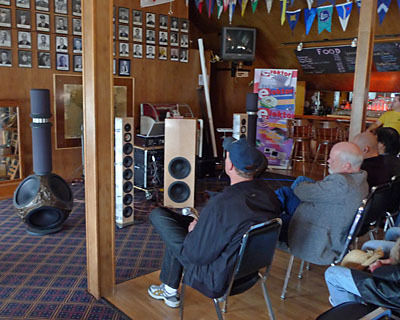 At the Rocky Mountain Audio Fest we showed ORION+ and Pluto-2 for the first time in public. For three days they played in a small but pleasant hotel room to a very large number of listeners. Many kept coming back for more. ORION and PLUTO owners brought friends. Both speakers did not make it back to California and Don Naples lined up new business. The showing was a combined effort of Madisound, and Seas in the room next door, and Wood Artistry, and Linkwitz Lab. Many visitors took this as an opportunity to talk to me personally about technical matters and also to express their appreciation for the work done. Thank you. This was also an opportunity for many to compare the sounds in our room to what was presented in other rooms and to learn something new. I was very pleased with the engaged audience that the RMAF brought into our room, unlike to what I had experienced at CES in earlier years. All together it was a very good event. Don Naples, Wood Artistry, demonstrates his ORION creation in Bubinga wood with Ebony trim. Just like last year this was a fun event and a great opportunity to meet interesting people, to talk audio stuff - some of it far out for me - to see unfamiliar products and to do some listening. All this in a relaxed, slightly chaotic happening, but free flowing and with a welcomed absence of "audiophile neurotics" and in a good spirit. My interest is, of course, loudspeakers and so I looked forward to hearing two exotic full-range drivers that would be mounted in Nelson Pass's large open baffle loudspeakers right on location. The first was a new Feastrex pair, the only one in existence and build with paper cones by a Japanese master craftsman using centuries old techniques for making archival papers. The drivers had very large diameter field coils. So did the Lowther pair, except these were in long cylinders. Both needed magnet supports since the baskets obviously could not hold the weight. The large 15" woofers had their own amplification and there was no shortage of bass output. The full-range drivers were straining and rather colored, though the Lowthers sounded more neutral. It was like viewing a slightly abstract painting when I wanted to see a photograph of the landscape. I did not hear anything that would have given me an incentive to investigate such drivers or to re-evaluate what I am doing. I was quite surprised to learn the retail prices of around $48,000 for the Feastrex pair and $4,400 for the Lowther pair. Nelson showed and used a clever power amplifier with a single depletion mode MOSFET device that he had designed and built the day before the Festival. With a slight amount of FET linearization and about 5W output capability and it was used for the Lowther pair. It all seemed to me an invitation to experiment with audio and to have fun with it. 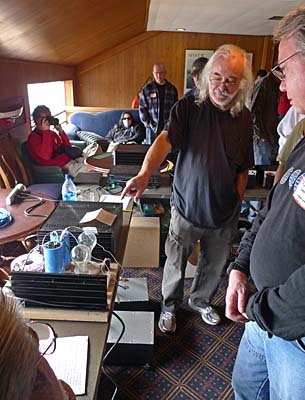 The Burning Amp Festival - 2008 in nearby Sausalito, California, gave me the opportunity to talk about my current preoccupation with phantom images in 2-channel audio playback and how they relate to how our brain has been wired to function for survival over millions of years. This has definite implications upon loudspeakers, rooms and recording techniques. The professional and DIY exhibitors for this one day festival came from a rich variety of backgrounds in amplifier, loudspeaker, turntable and electronic design. Their audience were dedicated audiophiles and each other. This was an opportunity for enthusiasts to meet as they pursue their passion. I briefly demonstrated Pluto-2, driven from an Oppo DV-980H, which generated a welcomed surprise and comments of musicality, imaging and warmth of sound. I had a good time at the event and returned home tired but satisfied from talking with many attendants.